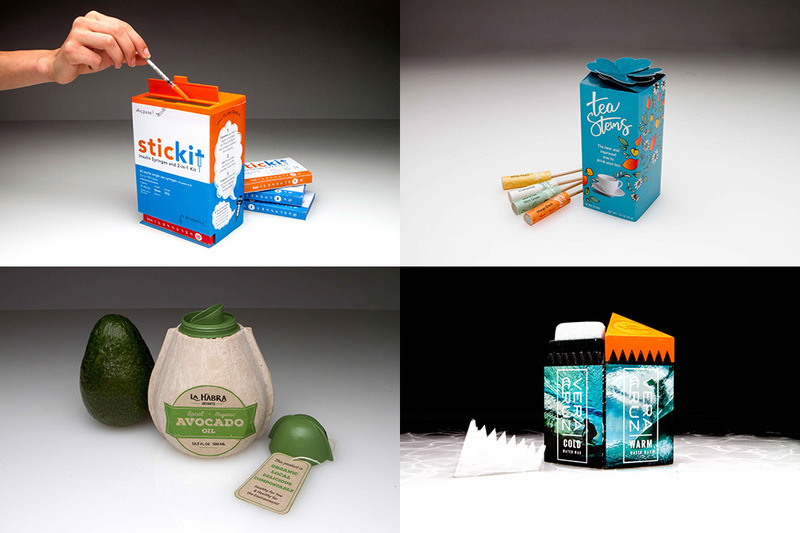 SAN LUIS OBISPO — Teams of Cal Poly packaging, business, and design students received two of the top three awards at the 2017 World Packaging Organisation (WPO) WorldStar International Packaging Design Student Competition that featured innovative package designs from university students from more than two dozen nations. The Cal Poly team behind “SticKit,” a two-in-one packaging system to dispense disposable syringes and safely store the empties, was among the top three entries. A pull tab on the bottom of the package dispenses boxed syringes; a hinged-lid on the top of the container can be opened and locked for safe syringe disposal. A plastic divider separates compartments, moving down with gravity as syringes are dispensed until it finally closes the container when all the syringes have been used. The other top award went to the team behind “Tea Stems,” an innovative way to package tea. The tea leaves are placed at the end of a cassava starch-based, compostable stick that makes it easy to stir the tea in the drink without using any utensils. The stems are packaged within a die-cut paperboard folding carton that “blooms” when the box is opened. The package was designed by industrial technology and packaging students Brendan Smyth (San Jose, Calif.), Simeon Comanescu (Pleasanton, Calif.) and Ryan Marrs (San Luis Obispo, Calif.), and art and design majors Alexandra Rosado (San Francisco, Calif.) and Lucia Astiazaran (Valencia, Calif.). “Vera Cruz,” a packaging system for surf wax that integrates a wax comb, a shell that minimizes sun exposure of the wax and a magnetic feature to store a surfer’s car keys. The design is made of injection-molded compostable PaperFoam. Its unique triangular shape offers an ergonomic grip. The dispensing mechanism was inspired by ChapStick packaging, which can contain and reshape a melted product. The package was designed by industrial technology and packaging students Brooke Billmeyer (Solana Beach, Calif.), Grant Badstubner (Danville, Calif.) and Sai Domanico (Hillsborough, Calif.), with art and design students Daniel Blenkinship (San Luis Obispo, Calif.) and Zach Baker (Rocklin, Calif.). “La Habra” houses avocado oil in a recyclable plastic pouch encased by two molded-fiber shells — inspired by the shape of an avocado. A pour spout with a drip return prevents the oil from spilling. The product was designed by industrial technology and packaging students Katie Exum (Torrance, Calif.), Michael Moorehead (Walnut Creek, Calif.) and Patrick McCaffrey (Irvine, Calif.), and art and design majors Jessica Ferguson (San Jose, Calif.) and Deric Shindledecker (Temecula, Calif.). The competition considered hundreds of packaging design submissions, including structural design and/or graphic design projects, from award-winning undergraduate and graduate student teams from countries around the world including Brazil, China, India, Sri Lanka, Thailand Korea, Oman, Yemen, Lebanon, Palestine, Jordan, Iraq, Turkey, Morocco, Tunisia, Egypt, South Africa, Germany, Poland, and the United Kingdom. Cal Poly teams were entered into the global competition after sweeping the top four awards at the 2017 Institute of Packaging Professionals (IoPP) Ameristar Student Packaging Competition for the second consecutive year. Cal Poly’s Packaging Program is part of the Orfalea College of Business. As the only program of its kind in a business school, it combines a full continuum of packaging design, development and testing courses with supply chain logistics and business strategy courses. The curriculum is rooted in applied research and the university’s Learn by Doing philosophy. Cal Poly’s Packaging Program serves leading companies in agriculture, retail, technology and manufacturing by providing top talent and valuable research.